Alpheus George Barnes Stonehouse, known as Al G. Barnes, a well-known circus owner of the Pacific Coast, was born September 1, 1860, in Lobo, Ontario, Canada, to Thomas S. Stonehouse and Sarah Barnes. He was one of those rare individuals who found himself to have an exceptional "way" with wild animals. They understood him and he them, thus resulting in his development of probably the leading trained wild animal circus of Amercia. The well-known circus owner of the Pacific coast, Al G. Barnes, died July 25, at his ranch in Indio, California. He was 68 years of age. He had been ill for most of the past year, pneumonia and complications being given as the cause. His right name was Alpheus George Barnes Stonehouse. He was born in Lobo, Ontario, Canada, September 1, 1862. He was married three times and is survived by all three, Mrs. Dollie Barnes, Mrs. Jane Barnes, and Mrs. Margaret Goldsboro Barnes who at his death was at his bedside, he having married her last December. Two daughters and a son by his second wife also survive. He also has a sister, Mrs. Lydia Bishop. His circus career was spectacular. He built up a well known circus and wild animals show in which he introduced no few novelties and original stunts, many of which are now incorporated in other shows. With Dolly Barlow, who later became his first wife, he started a small wagon show in Glenwood Springs, Calif., in 1895. A pony and picture machine, then new, featured that show. His boyhood was spent on a farm. He built it up to as large as a thirty car railroad show. For the most part he always operated in the West but ten or so years ago he ventured across the Mississippi River and played the East. In January, 1929, he sold out to the American Circus Corporation. 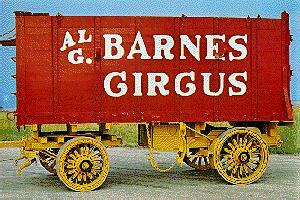 In September that year they in turn included the Barnes circus with the others that they sold to John Ringling. Ringling now operates the Barnes title. Barnes took part in his own shows up to the time he sold out. He appeared in opening on "Tusko", the huge elephant he featured.